I know a lot of girls go for something dressy and preferably a dress that would make the family gaze in amazeness. No… I rather want something dressy and kind of a tomboy touch to make the statement. 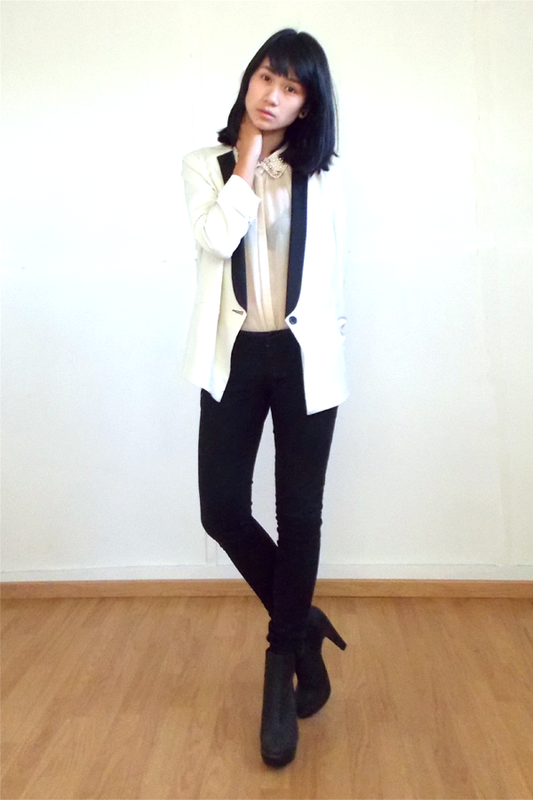 I would go for my white blazer with black lapel. Perfect for any kind of festive occassion (wedding perhaps?). The Vero Moda blouse with studs is my go to blouse whenever I want to dress more fancy. Nothing says sophisticated fancy than a blouse with a pearled collar. Just added some heels because I definitely would want to be the tallest one and everyone can look at how amazing I look (not to sound arrogant or something) and there you have it! My perfect Christmas outfit! Fab in this tuxedo jacket!!! By the way, I'm a quite new blogger, a little golden sheep who fled his flock to create his own style and to share it with everyone ! I like the blazer so much! Hi, Monica, this outfit is very cool, I loved your white blazer, and your never-ending legs make you look like a model, the whole look is pure teenage elegance. Sure! But please provide me with a link when you do so 🙂 Thanks!